Vintage Collection Game: Garage sales are always interesting for people who love to buy things cheaper. Half price and even more you can get things that are not used too much, that someone doesn’t need anymore, but you might find them perfect for yourself. And why on Earth we need all the brand new things at home. One should be practical at this point. We don’t live hundred years to have everything brand new. Dorothy and Mark are preparing vintage collections and they do it the best way they can. They are actually the best in the country in the vintage creations. They follow all the garage sales in their country and they buy objects. And they know that if they prepare one whole collection they will earn more money than they had given. Today they arrive on one garage sale. They got insider information that they can find objects for their collections. 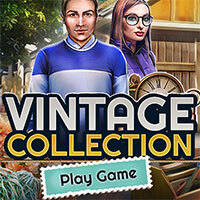 Enjoy and have fun in playing Vintage Collection Game.